This may go down as one of the most busy February months of our family’s life. On Sunday we wrapped Alumafiesta in Tucson, which was a considerable event in itself, and now we are embarked on a 2,000 mile cannonball run across the southern tier to Florida, where we will work on Alumaflamingo for another week. Fiesta was a success. We had about 100 Airstreams in the campground (after a few last-minute cancellations) and it seemed that just about everyone had a great time. The program was as packed full of activities as we could make it, and so Brett & I were busily running around for five days making sure it all happened as we’d planned it. After running all the activities of the event (many seminars and off-site tours, five Happy Hours, a bike ride, two walks, one hike, two breakfasts, one dinner, three Open Grills, four evening presentations, Food Truck Friday, a ukulele practice session, etc.) we were all completely exhausted. And that’s where Aluma-Zooma comes in. Due to a series of circumstances mostly beyond our control, we have a second event this month: Alumaflamingo in Sarasota Florida. Because it is the first year for Flamingo, we decided it would be best if we took the Airstream to that event rather than flying in, which means that on the last day of Alumafiesta we were re-packing for immediate departure east on I-10. We have to traverse seven states in a week, a rapid pace in the best of circumstances. These are not the best of circumstances. On the last day of the Fiesta I began to detect the impact Emma’s cold virus on myself, and then Eleanor began to feel some symptoms too, so our tow vehicle became a sort of plague ship with the three of us all sporting various symptoms—and nearly 2,000 miles of rapid driving ahead. Brett, meanwhile, has flown ahead and will be spending the next week trying to get all the remaining pieces of the Flamingo event puzzle into place; not an easy task with nearly 240 trailers expected, 23 vendors, and a schedule just about as packed as the one we just completed in Tucson. I can’t do much to help while I’m driving, so at this point I’m just a telephone consultant with a hoarse voice. We left Tucson at about 3:30 pm on Sunday and pulled into Lordsburg NM that evening for an overnight boondock behind a restaurant. I was feeling pretty poorly and crashed into bed at about 8:00, waking at 4:45 with a raging sore throat, but got back to sleep and by 7:00 a.m. was feeling much better and looking somewhat less like a person with terminal fatigue. 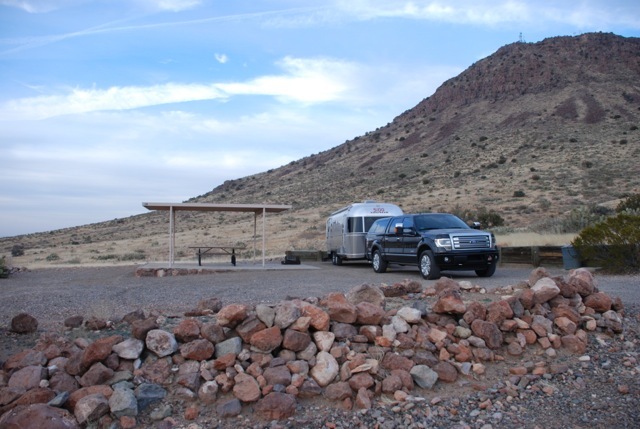 Eleanor pitched in later on Monday by towing the Airstream 100 miles of our 350-mile daily quota even though she wasn’t feeling top-notch herself, and so tonight we are in Balmorhea State Park in west Texas and all is well. As expected, we have driven out of the balmy southwest weather and into that deep freeze that we keep hearing about on the news. Even here in southwest Texas, it was 38 degrees before sunset, a horrifying change from the lovely 70s that Tucson is currently enjoying. I couldn’t hook up the water hose because it is going to freeze tonight. 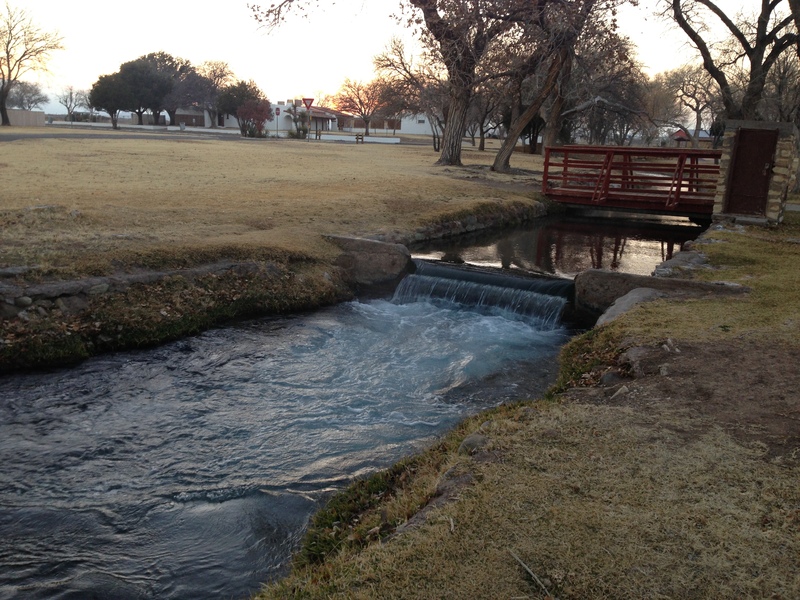 Balmorhea is famous for its crystal-clear warm water springs, and normally we’d go swimming or snorkeling here, but even with water at 80 degrees or so it is just too darned cold outside to even consider the idea. So instead we just fed the catfish and watched the turtles swimming before the skies became dark and fiendishly cold. The trip plan is to drive about 300-400 miles daily all the way to Sarasota. With time being short, it’s going to be Interstate highway all the way. Not very interesting. Still, since we’ve all done this trip many times (but not as a caravan) we have the opportunity to share our favorite roadside stops with each other, and that’s fun. I’ll update the blog as often as I can while we are traveling, and you’ll also see brief updates and more photos on Twitter (follow @airstreamlife). That energy level I mentioned in the previous post has very suddenly kicked into a higher quantum state. (Apologies to real physicists who are wincing at that statement.) 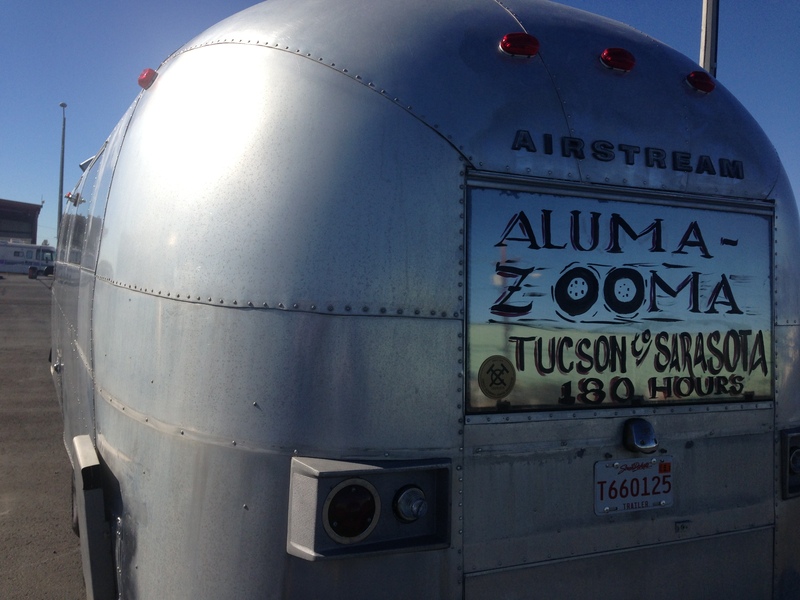 Airstreams are pouring into Tucson from all over, and it’s impossible for me to remain calm about it. Lately I can’t drive in the southwest corner of Tucson without seeing one on the road. Normally Airstream spotting is a rare event, but this week it’s a regular thing. Today I made my daily trip to the Alumafiesta site and found silver dots all over the 400-site campground. Right now they are a minority but by the end of the day Monday a giant aluminum formation will take shape: Airstreams lined up in rows, signalling by their shiny presence that something interesting is about to happen. My main mission today was to drop off the ’68 Caravel for Brett to use. While I was trying to set it up in the site, two non-Airstream owners came by separately to talk about vintage trailers, and one Airstream owner as well. This was fun but it made setup take about an hour. That Caravel sticks out in a crowd. 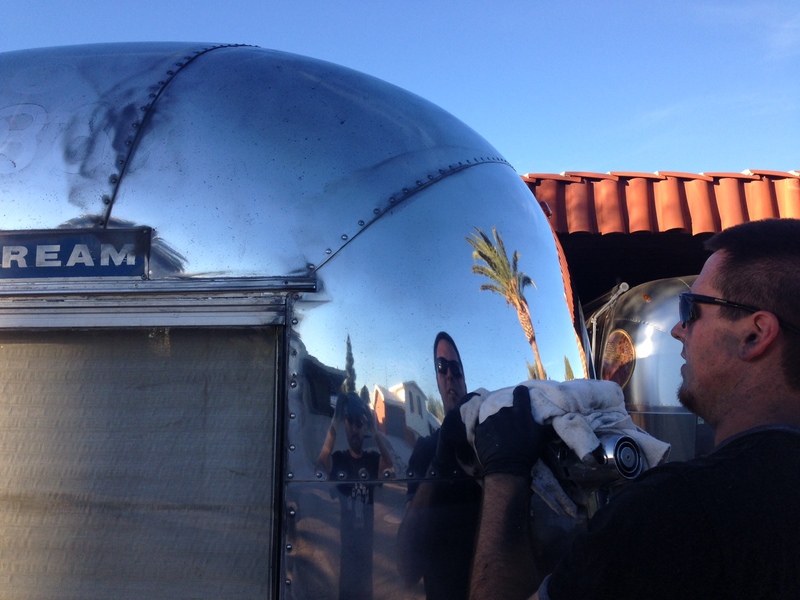 There is no flying under the radar in a vintage Airstream. In just a couple of hours I ran into Koos and Stefan (who flew in from The Netherlands to attend Alumafiesta), Rob, Chris, Stevyn & Troy, Numeriano, and a few other people who waved from a distance. I’d say there are about 15 Airstreams in the park right now, and that’s just the beginning. That’s in addition to the several Airstreams that are boondocked in BLM land off Rt 86, near Saguaro National Park West. Yesterday I had lunch with Chris and Leslie. 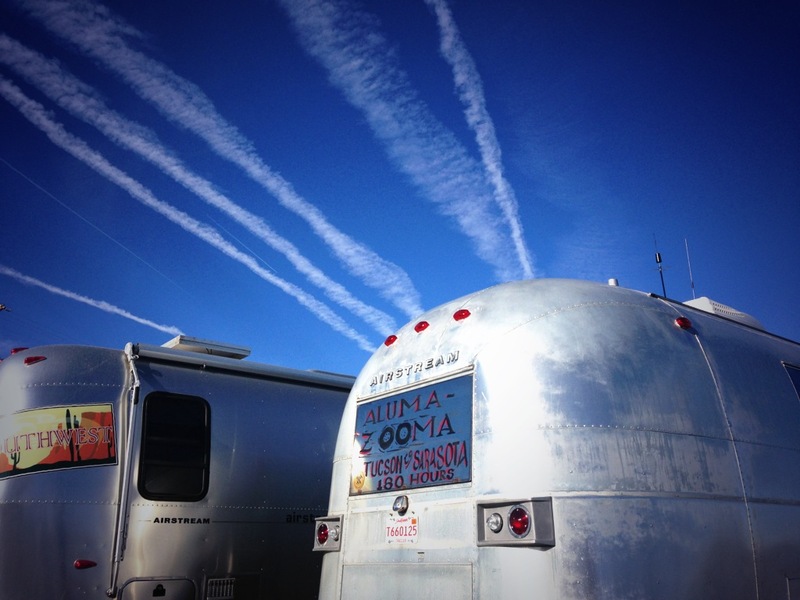 They are attending Alumafiesta in a brand-new 30-foot Airstream bunkhouse. 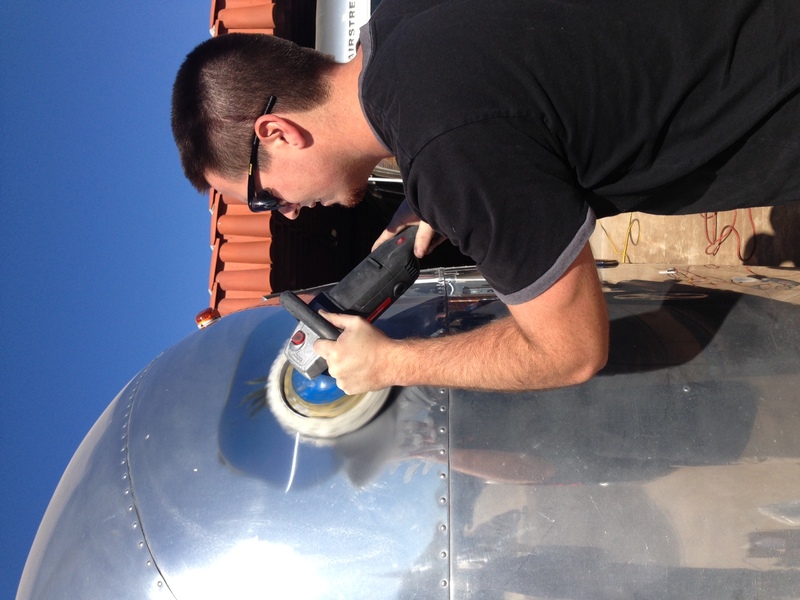 Leslie writes for Airstream Life, and Chris is the developer of our new—TA- DA!— iPad app. 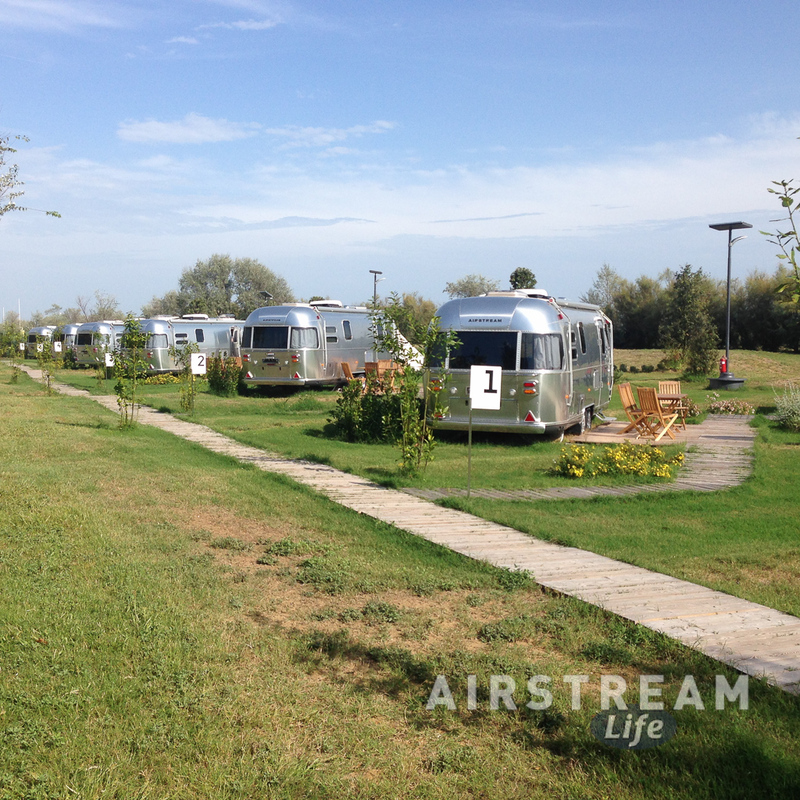 Yes, Airstream Life is finally available in digital format on iPad. Almost every issue published (minus two) is available, which is pretty remarkable considering most have been out of print for years. If you’ve got an iPad you can check it out (free) by clicking here. We’ve got a special limited time offer on eight of the back issues for $0.99 each, and if you are a subscriber you get four issues for free! I had a small surprise this week after sending out a notice to attendees that we would be doing an informal “beginner class” on ukulele. I figured that maybe two or three people would be interested. Suddenly about 15 people came out of the bushes waving ukuleles, and about a third of them had never actually played one. So I’ll be leading a group at 1:00 on Tuesday, and if it goes well we will probably have a few sessions during the week. I’m excited about that. Maybe we’ll get a few songs up to performance quality and play for the attendees at one of the Happy Hours. Tonight we are having a pre-event “kick back” dinner at home, before the heavy action begins tomorrow. This is our last chance to have a meal as a family at home, so Eleanor has made some nice mushroom risotto and a cake, and I’ll be grilling steaks. Tonight we feast, for tomorrow we enter the fray … It should be a great week.